France’s involvement in Libyan coalition campaign hasn’t made much of an impression on voters closer to home. FRENCH PRESIDENT NICOLAS SARKOZY spent the week leading the international effort to enforce a UN resolution for a no-fly zone over Libya. But the president’s time in the limelight risks ending on a sour note, with his governing conservative party expected to take a drubbing in local elections, where his newly burnished international stature will likely count for little. French leftists and the resurgent extreme right are widely expected to consolidate their gains tomorrow in the second round of voting in France’s cantons, subdivisions drawn up in the 18th century that are the country’s smallest administrative segments. The elections serve as the last test of parties’ nationwide strength before next year’s presidential elections. The leading role of the unpopular Sarkozy in launching the international military campaign in Libya — on the eve of the first round of voting March 20 — appeared not to have swayed the outcome in France’s cantons. The opposition Socialists gained the most votes overall in first-round balloting a week ago with about 25 per cent of votes, according to preliminary results Sunday night from the Interior Ministry. Sarkozy’s conservative UMP party plus allies on the right had about 32 percent overall, Interior Minister Claude Gueant said. However, the UMP alone had less than 20 percent of the vote, French TV stations and rival parties noted. The interior minister’s method of counting that covered up the poor UMP party showing led to claims that the minister was being less than candid — as the far-right National Front bounded ahead. The party, which gained 15 per cent of the vote, is riding a wave of popularity of its new leader, Marine Le Pen. Like her father, the party’s charismatic founder Jean-Marie Le Pen, she has tapped into worries about Muslim immigrants — but with a softer touch. Turnout was exceptionally low, however, at about 45 per cent. Voters in this election care little about Sarkozy’s renewed global stature, political analysts say, and France’s leading position in pressing for an international force to assure a no-fly zone over Libya and protect the population will have no bearing on Sunday’s poll. “Sunday’s election will be a double test for Nicolas Sarkozy,” said political analyst Stephane Rozes of corporate consulting firm Cap. “First he will see if he has limited the UMP’s decline. And second, he will see if the strategy established in the Grenoble speech works or not in view of the 2012 election,” Rozes said. In a speech last July in the southeastern city of Grenoble, Sarkozy carved out his political territory — one that clearly treads on ground familiar to the National Front — by saying he wanted to revoke French citizenship of any immigrant who endangers the life of police officers. He has since pulled back on that, but his party has pushed forward on another front, the principle of secularism so dear to France, with plans for round-table discussions April 5 that would center on France’s Muslim population of about 5 million, spurring a contentious debate. A pasting by France’s bickering leftists and the resurgent National Front might intensify divisions in Sarkozy’s UMP party that have emerged since recent polls raised the specter of the conservatives being knocked out in the first round of presidential elections next year — or forced to face down the National Front in an embarrassing replay of 2002 elections. Then, conservative President Jacques Chirac was in a showdown with the elder Le Pen, and saved when left and right banded together to ensure Le Pen’s defeat. Recent opinion surveys have showed Sarkozy’s approval ratings at historic lows. Leftist voters are angry at his cost-cutting measures and say he is too cosy with corporate interests. Many conservatives are disappointed that he has not been bolder about loosening up the labor market and hasn’t eased tensions between police and youth in suburban housing projects. A win in a cantonal election gives the victor a seat on councils overseeing France’s departments, or provinces. 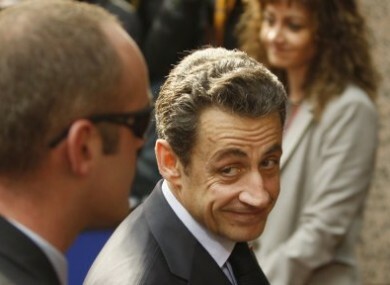 Email “Local election defeat on the cards for Sarkozy's ruling party ”. Feedback on “Local election defeat on the cards for Sarkozy's ruling party ”.